I recently shot a popular local band in my home studio. While the end result was both useful and pleasing to them, I was frustrated by my lack of ability to get enough light on them to freeze their squirrelly movement. [Refer to my previous post for some possible insight on that.] At that point I had a collection of clip lamps with various bulbs, both tungsten and compact fluorescant. I had also just added a 250 watt studio modelling lamp with a stand and umbrellas (for bounce or soft box effect). That was sufficient for Model M (NSFW) and Mercureality. However, it was not up to the task of 8 squirmy subjects. I believe I have solved my light problem. 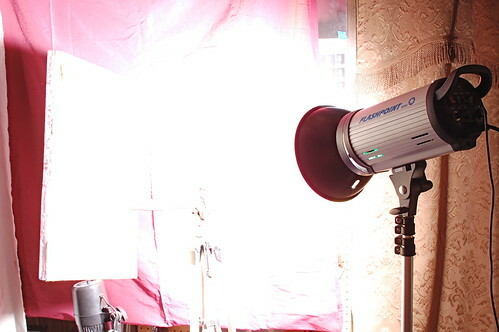 This Flashpoint 300 watt-second strobe throws serious light in my small studio. I suspect (hope) that I will often dial it down from full power for my needs. But when I need to STOP! the action using fast shutter speeds, I know I can make it work.